Hugging Pigs | MWAH! S&P Shakers Figurines | One Price Low Flat Shipping! From Westland Giftware's Mwah! Salt and Pepper Shakers Collection, Hugging Pigs magnetic shakers. Made of ceramic with glossy finish. Measures 3" tall. Hand wash only. 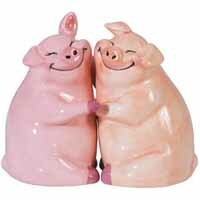 This adorable salt and pepper shaker figurine set features two smiling pink pigs in a romantic hug. Perfect gift for any pig collector! A strong magnet holds the two pigs together.